Beurre Hardy is a classic French pear from the early 19th century, which has long been popular in England. Beurre Hardy has an excellent flavour, and the buttery melting flesh which is characteristic of the best quality French pears. 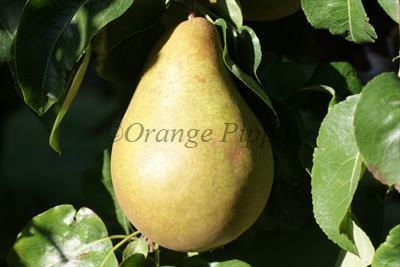 As with most high quality pears, pick when still firm / hard, and ripen indoors. Please fill in the details below and we will let you know when Beurre Hardy pear trees are back in stock. Beurre Hardy is in flowering group 4. Beurre Hardy is self-sterile and needs to be pollinated by another tree of a different variety nearby. Beurre Hardy performs best in the south and east of the UK, in areas with good soils and plenty of warmth and sunlight. Provided conditions are right it is a reliable cropper and quite easy to grow. The leaves turn a characteristic dull red in autumn. Raised by M. Bonnet, a fruit enthusiast from Boulogne in northern France, around 1820. Named after M. Hardy, a Director of the Luxembourg Gardens in Paris.